Agloomy mix of low clouds and rain delayed the space shuttle Discovery'sreturn to Earth Monday, forcing its seven-astronaut crew to spend at least one moreday in orbit before coming home. Thefoul weather at NASA's Kennedy Space Center in Florida thwarted two separateattempts to land Discovery on a runway at its home port. 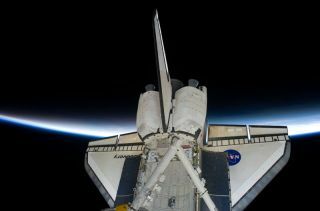 The next chance toland the shuttle will come on Tuesday at 7:33 a.m. EDT (1133 GMT). Discovery'screw of seven astronauts thanked Mission Control for its efforts tosalvage a landing from today's gloomy weather. "Weknow how much workload it is and we appreciate everything you've done,"shuttle commander Alan Poindexter told Mission Control. "We'll be hopefulfor better weather tomorrow." Discoveryis returning to Earth after resupplying the International Space Station withtons of fresh supplies and new science equipment. With Monday's landing delay,the astronauts are now wrapping up a 15-day mission to stock up the orbitinglab. NASAhoped to land the shuttle early Monday morning, but Mother Nature refused tocooperate. Shuttle flight rules forbid trying to land a space shuttle with rainshowers within 30 miles of its runway because the weather can damage thespacecraft's fragile heat shield tiles, among other risks. Lowcloud ceilings, like the one that thwarted today's first landing attempt, arealso a problem because they affect runway visibility for shuttle commanders andpilots. The cloud layer today was just 200 feet above the ground with visibility restricted to 2 miles, unacceptable for any shuttle landing attempts, NASA officials said. Itis only the second time since the tragic loss of Columbia in 2003 that a NASAshuttle has flown over the United States during re-entry and approach tolanding (the last time was in 2007). NASA typically prefers to fly shuttles infrom the southwest to avoid flying through high-altitude noctilucent clouds andflying over populated areas. MissionControl opted for the trajectory for Discovery's landing in order to give theshuttle astronauts extra time during their busy mission. IfDiscovery is unable to return to Florida on Tuesday, NASA could opt to land theshuttle at a backup runway at the Edwards Air Force Base in California. Theshuttle has multiple opportunities to land at both sites on Tuesday. But NASAprefers to land Discovery in Florida ? the shuttle fleet's home port and launchsite ? since it saves about a week of time and $1.8 million in transport coststo ferry the spacecraft home from California atop a modified Boeing 747 jumbojet. Thevast ash cloud from Iceland'sEyjafjallaj?kull volcano poses no concern for Discovery's re-entry andlanding. Unlike air traffic in Europe, the shuttle's landing approach is wellclear of any regions affected by the volcanic ash plume. Discoveryhas enough supplies to remain in space until Wednesday, but NASA wants to landthe shuttle by Tuesday in order to keep one day in reserve in case of anunexpected malfunction. Astuck valve inside the new tank has kept it from working properly, but MissionControl opted to have station astronauts fix it later on future spacewalk. Thismission is one of NASA's last few shuttle flights before the space plane fleetis retired in September. It is the second-to-last mission for Discovery, whichis NASA's oldest space shuttle. Afterthis flight, only three more shuttle missions remain. NASA's next space shuttleto fly is Atlantis, which will deliver a new Russian module to theInternational Space Station in May. Atlantisis due to roll out to its seaside launch pad tonight. SPACE.comis providing complete coverage of Discovery's STS-131 mission to theInternational Space Station with Managing Editor Tariq Malik and Staff WriterClara Moskowitz based in New York. Clickhere for shuttle mission updates and a link to NASA TV.